Runners in Rock Creek Park are used to enjoying the beauty of nature during their workouts. Attacking owls aren't as enjoyable. WASHINGTON – Runners in Rock Creek Park are used to enjoying the beauty of nature during their workouts. But owls attacking passersby aren’t quite as enjoyable. “I felt this scraping sensation along the right side of my head, and much to my amazement an owl flew away,” says Laurie Cantillo, who fell victim to a dive- bombing owl Wednesday evening as she was jogging along a path off Grubb Road in Silver Spring, Md. Cantillo, the program director at WTOP, says she had no warning. “That’s what was really freaky. You don’t hear a thing. Now I know what a squirrel feels like,” Cantillo says. Other runners in Cantillo’s group reported encounters with the owl when they rendezvoused after their runs. “I do a lot of bird-watching. It was rounded in shape, was definitely not a hawk. I came home and Googled it. It looked like a barred owl, if I had to guess,” says Cantillo, who was not seriously injured. Cantillo isn’t the only runner to report an owl flying at them, wings and talons outstretched. WTOP’s traffic reporter Dave Dildine says he has had several run-ins with owls in Rock Creek Park and Reston. He managed to track down one of the suspects and took its mugshot. Other joggers in the region report similar incidents. “It looked just like a nature program when the owl is about to hit its prey, except it wasn’t in slow motion and it was coming at me,” Stuart Kern of Silver Spring tells The Washington Post. Peter Grace told his running group he was “quite literally attacked from above by a large owl” on Sept. 4 along Glen Cove Parkway in Bethesda, Md, the Post reports. Grace also thinks his attacker was a barred owl, but it’s not clear why the birds are interacting with humans. 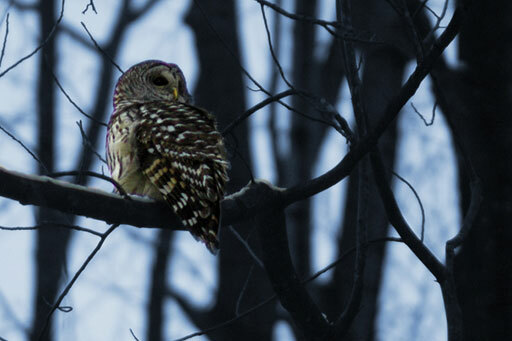 Some scientists say owl strikes are more common in autumn, primarily at dawn or dusk. “That’s when vision is not always the best with people or with animals,” says Dan Rauch, fisheries and wildlife biologist with the District Department of the Environment. Owls are private creatures, he says. They keep to themselves and do not like humans. Though it is impossible to say what this particular owl was thinking, Rauch says there are a few possibilities for what caused the attack. Most likely it was a case of mistaken identity, he says. Cantillo’s ponytail could have looked like a squirrel or other small rodent that appeared particularly enticing to the bird. Another possibility is that the joggers passed too closely to a previous kill, and the owl felt threatened by their presence. Despite this apparent wave of avian attacks, humans are not in danger, he says. WTOP’s Alicia Lozano contributed to this report. Follow Neal Augenstein and WTOP on Twitter.